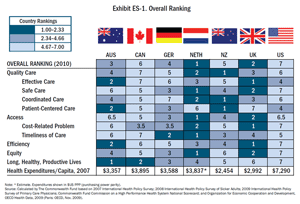 Check out the ratings and cost of Health Care here compared with Australia, Canada, Germany, Netherlands, New Zealand, and UK. It is apparent that the U.S. is lagging in adoption of national policies that promote primary care, quality improvement, and information technology. Health reform legislation addresses these deficiencies; for instance, the American Recovery and Reinvestment Act signed by President Obama in February 2009 included approximately $19 billion to expand the use of health information technology. The Patient Protection and Affordable Care Act of 2010 also will work toward realigning providers’ financial incentives, encouraging more efficient organization and delivery of health care, and investing in preventive and population health. Medicynical Note: We will need to improve our non-system’s inefficiencies and develop an approach that provides value, maintains quality, and improves access. The Patient Protection and Affordability Act of 2010 is an important first step. The question is whether our democracy, while in economic crisis, has the will to do this.